Public Member Trees, Ancestry.com, "MyOrigins" family tree, by emilyday137. From his wife Nancy's aplication for a Confederate pension from the state of Alabama. She was "Mrs. N. C. Thornton" and her husband was "C. W. Thornton." E-mail written Jun 2008 to Lew Griffin from Patrick Thornton, e-mail address. Find A Grave Memorial# 95138426. Series: T624 Roll: 12 Part: 3 Page: 22B. Roll: T625_14 Page: 9A ED: 84. Lightwood, Elmore, Alabama; Roll: 13; Page: ; Enumeration District: 21. "Mrs. Janie Carmack, At 99, Still Enjoys Work, Church And Movies"
"By Annie May Turner, Daily News Women's Editor"
Caption under picture reads: "Mrs. Janie Carmack, whose hobby is needlework, is shown with a quilt she has been working on while visiting her son, J. L. Carmack, who will be 81 years old next April. At her feet is a rug, also a part of her handiwork." A sweet little lady with beautiful dark eyes, a lovable disposition and hands that usually are busy with some type work, is visiting her son and daughter-in-law, Mr. and Mrs. J. L. Carmack, 110 Melton. The visitor is Mrs. Janie Carmack, who will be one hundred years old next August. She looks much younger. Her mind is keen and her eyesight amazing -- she uses glasses only for reading and can see newspaper headlines without them -- but her hearing is rather poor. Her ears are pierced and she has worn the same pair of yellow gold earrings for sixty years. Mrs. Carmack lives in Winfield, Texas, where she formerly had a hotel. Her home is in a two-apartment house, and her neighbor across the hall also is an elderly woman. She takes care of her four-room home and even sweeps her yard. There's a strawberry patch in the garden, and when berries are there, she picks them, a job too hard for the average fifty year old person. She does her laundry and cooks her meals. Last summer, she helped cook her birthday dinner, also helped serve the seventy-five guests. As there was food left from the party, the next day she invited twenty-five friends to lunch. Food isn't a problem for her, she eats anything. Her favorite breakfast is oatmeal, sausage and biscuits. And she's crazy about fish -- any kind of fish. As she has an engaging personality, Mrs. Carmack has many friends. Every day, except Sunday, five, six, or seven call at her home. She attends Sunday services at Winfield Baptist Church, and her rocker is near the pulpit so she can hear the music and sermon. She isn't one to waste time, so spends many hours with needlework. Each year she makes twenty-five or thirty rugs and also pieces quilts. Of all quilt patterns she prefers the tulip. To her it's the prettiest. And she loves going to the drive-in theater where she enjoys motion pictures of all types, even shoot-'em up westerns. When asked what has been of the most importance during her life, Mrs. Carmack replied: "Being a Christian and having good health." Her mother, by the way, almost was a hundred years old when she died as the result of an accident. She fell, and broke her hip. Mrs. Carmack has a daughter, Mrs. Boss Smith, who lives in Winfield, and numerous grandchildren, great-grandchildren, and great-great-grandchildren scatter all over Texas. One great-grandson is in Japan, another in South America. Tomorrow, Mrs. Carmack will return to her home in Winfield. "Winfield Resident 100 Years Old Wednesday"
How does it feel to be one hundred years old? Mrs. Janie Carmack, widow of the late Tom Carmack, reached that goal Wednesday and answered a Daily Times reporter in this way: "Son, I feel just as old as you think I look." All of her friends know Mrs. Carmack as "Granny" and Wednesday she was showered with gifts at her home in Winfield. A formal celebration of her birthday will be held there Saturday. Granny was born in Alabama on August 22, 1856, but moved to Texas 30 years later. She has lived in Titus County 60 years and in her present home 40 years. She and her husband farmed for a while but later operated a hotel and boarding house in Winfield. Meals were served for 25 cents and beds were available at 50 cents. Granny has outlived all of her five children with the exception of one, Mrs. Boss Smith, also of Winfield, who is 76 years of age. Her husband died at the age of 69. Her mother, she said, lacked three months being one hundred when she fell and broke her hip and failed to recover. Despite her age, Mrs. Carmack does all of her own work without the benefit of most of the so-called "modern conveniences." She has been busy all of her life and even now tends her chickens, her strawberry patch and churns her own butter. Her eyesight still is good, but she admits she needs glasses when she reads. Her hearing is failing some, too, she said. Her home doesn't have running water. Instead she draws what she needs from a well, but as she said Wednesday afternoon, she draws only a half bucket at a time, "not feeling quite up to a bucket these days." When a Daily Times reporter called at her home to take pictures on her birthday, Granny put him in a chair and told him to wait, while she changed her dress and fixed her hair. No one was going to take pictures until she was ready, she said. Not only has she been showered with gifts, she had received 80 cards Wednesday wishing her many more birthdays. More were sure to come before the "big party" saturday. Granny is looking forward to the party when her friends and descendants will gather at her home for a big dinner and a day of fellowship, but she isn't happy over the prospects of not being allowed to take part in the preparations for the occasion. She is used to doing her own cooking and wants it that way, even now. This reporter tried to find out how many of her descendants there are and asked her how many grandchildren, great-grandchildren, and great-great-grandchildren she has. "Son," she said, "You'll just have to wait till Saturday when they get here and I can count 'em. I just don't know off hand." When she was asked to what she attributes her old age she said simply: "God's been good to me." she is sure to have hundreds of people call to pay their respects. "Mrs. Carmack Has Her 102nd Birthday Friday"
There was a birthday party in Winfield Saturday. It wasn't an ordinary birthday party and the honoree wasn't an ordinary citizen. Greeting guests at her Winfield home, was a spry Mrs. Janie Carmack, Titus County's senior citizen, who is noting her 102nd birthday. Actually, Friday was Mrs. Carmack's birthday, "Granny" Carmack, as she is known to most Titus County folks, was born August. 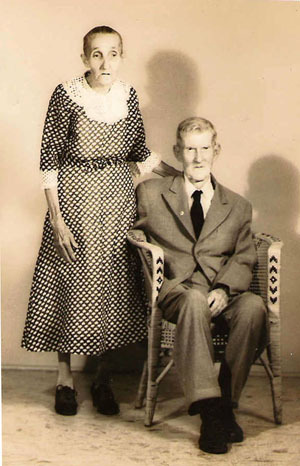 22, 1856, in Chambers County, Ala.
She came to Titus County more than 60 years ago with her husband, the late H. T. Carmack. "Granny" has lived in the same house in Winfield over 40 years. Until two months ago she had lived mostly alone since the death of her husband in 1925. Now she has an 88-year-old "boarder," Mrs. Lena Brown. "It's nice to have a youngster around the house now," the agile centenarian chuckled. "Granny" still does most of the household chores, including all of the cooking in the weathered two-story frame house in the heart of Winfield. At one time, she operated the home as a boarding house. "Things were sure different in those days," she says, "Meals cost two bits and beds were four bits." "Granny's" health is good. She hasn't had a serious illness in months. Her hearing is failing but her eyesight is still sharp, with spectacles. She believes long life is hereditary. Her mother, the late Mrs. M. C. Murphy, was almost 100 when she broke a hip and died. Her advice to those seeking long years is "to stay out of the rocking chair, work and keep moving. Don't let the clack catch up with you," she warns. "Granny's" mobility is amazing. During a rainy Thursday afternoon chat, a lightening bolt struck nearby. She jumped instantly from her chair, ready to survey the damage. She can't accurately total her descendants. "They're scattered from Texas to Pennsylvania," she says. Two live in Titus County. Her only living daughter, Mrs. Boss Smith, 78, an invalid, lives nearby. A granddaughter, Mrs. Denison Clay, lives on Route 3. Hundred of friends called Saturday. There was an old-time big noon meal for guests. And the biggest smile all day was worn by Mrs. Janie "Granny" Carmack, senior citizen of Titus County. From Brenda Banks, March 2004: "I was going through some old things my sister in law recently sent and read a couple of letters addressed to Bethly Jane Carmack. The began "Dear Aunt Janie" and "Mother" and was signed Lee Miller (I assume that the Mother must be a sister to Bethley Jane, possibly Carrie?.) The other I came across was a Mother's Day Card, I think. Inside was written to "Dear Mother and Sister" (Martha and Bethley Jane?) and signed Lizzie and girls. I have come across something else in the past signed Lizzie and girls that we believed was addressed to Martha Murphy. I also came across an old picture, probably around the turn of the last century. It is a young man and woman. He is in a suit and sitting, she has her hand on his shoulder and is standing. Perhaps a wedding picture. Anyway, Chuck thought is looked like it could have been a young Martha C. Murphy. Of course, the only pictures that we know for sure are her, she is quite old. Anyway, on the back of the picture was written in pencil Dora Spillman." Contact Lew Griffin, lewgriffin@cox.net, if you can shed any light on any of these folks. E-mail written 2000-2009 to Lew Griffin from Brenda Elizabeth Glass Banks (Mrs. Charles Lewis Banks). Henry T. Carmack to Janie Terly, 3 Dec 1873, by John Hughley, N. P. with H. T. Carmack and S. M. Robertson, L. S.
This from "Marriage Records 1861 -- 1890 of Chambers County, Alabama, Volume II, by the Genealogical Society of East Alabama, 1974.